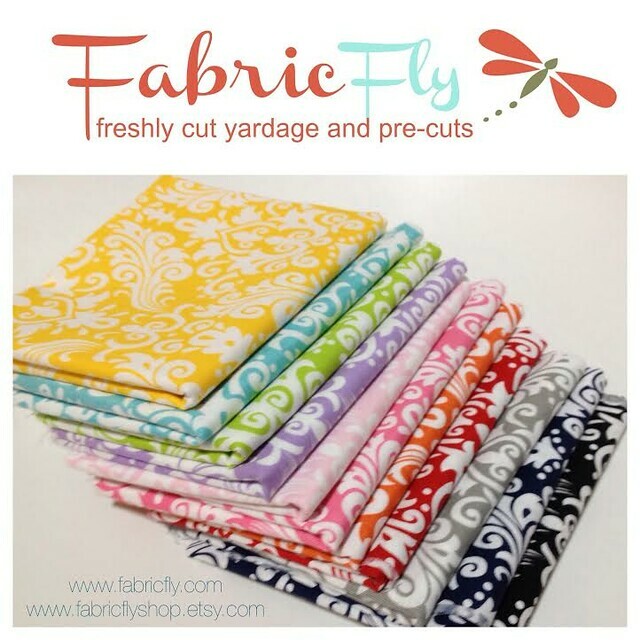 For this week's Fabric Giveaway Fabric Fly is offering a Fat Quarter bundle of Riley Blakes's new and very useful Damask Basics fabric collection! This bundle includes an assortment of eleven colorful damask prints to one lucky reader! In addition, Fabric Fly is offering 10% off in their shops beginning today -- Friday, Feb. 28th through the duration of this Giveaway! Simply use Coupon Code: MCHandmade10 on both their website (www.FabricFly.com) and in their Etsy Shop (www.FabricFlyShop.etsy.com) to enjoy the discount!! That’s 4 possible entries! Enter now through Monday, March 3rd. The winner will be chosen by Random and I will announce their name on Monday, at the bottom of this post, here on the blog! Congratulations, I'll be in touch shortly! Those are gorgeous! I couldn't resist entering! Thank you for a chance to win. I would love to add these to my stash-thanks for the opportunity! And I follow you in Feedly-thanks again! Love these! Thanks for the chance! I NEED those in my life ;) Thanks for the giveaway! What lovely prints:) Thanks for the chance to win. I follow you on Facebook and I shared! Love the print -- & the colors! I follow you on Facebook!! Love all your quilts! love these prints !! have some fabric that would go great with these !! How beautiful those colors are!! Sharing your post on Facebook! I love this print and the colors are fabulous. They look so nice and "SPRINGY" and after the winter we have endured, we all need something like this . . . . . Following Fabric Fly on Facebook! I shared this blog post on facebook! Great fabric! I see lots of possibilities. I love this design and colors. Beautiful prints and colors...to make beautiful creations for the home! Thinking Spring. I love this fabric. Bright and beautiful!! Great Fabric. The colors would be great for a pattern I just saw! Those fabrics are beautiful! following Fabric Fly on facebook! I am now a follower of Fabric Fly on facebook. Gorgeous fabric! Following Fabric Fly on face book! Just the fabric I have been looking for. I follow on Facebook. I'm a FB friend of Fabric Fly. gorgeous fabric and found out about this on Facebook! I follow you on Instagram. Love damask fabrics! There is so much gorgeous fabric, this is no exception! OH and follow Fabric Fly on FB also ♥ THANKS! I follow you on feedly and IG! What a great line of basics! Have a great weekend. I follow you on Instagram as Sewwhalemade. Very pretty material!! I want to start my first quilt soon, and these would be fun to put in it! Thanks for a chance to win this beautiful fabric! These would make some great blenders for a quilt I am planning!!! Beautiful collection of fabrics and colours. Thanks for the chance. I have been a fan of yours on facebook for a while now. You are so creative! I enjoy following you on Facebook. Gorgeous! I'd love to build my stash with some beautiful fabrics. I follow you and love your posts. I am a follower of yours, Maureen. Thanks. Love the fabric. I am using fabric samples to make charity quilts and they would fit right in. I follow you on facebook. Love the blog. Great pictures. I follow you on fb! My fabric Friday reminder! Very pretty fabric, would love to win. Great design and colors. Love to add them to my stash! I follow Maureen Cracknell on Facebook! I would love to make a lap quilt with these! Following Fabric Fly on FB. Love keeping up with what you're creating always! Always look forward to Friday giveaways! Thanks! Ooh those colors are amazing! I follow you on Facebook & Instagram! Have been a follower her and on FB for a while now, thanks! I'm following Fabric Fly on Face Book! So pretty!!! I need this for some appliques!! So cute!!! I'm sharing the giveaway on Facebook. Absolutely love this fabric, aww! I love this fabric bundle. Always love your feature fabrics. These are great! I love your material. Yours is always so bright and cheerful. Post on FB and comment too on your site. Now reposting on this site. Lovely fabric , great to use for operation Christmas child shoeboxes to make craft for them . Thanks for the chance!!! Lovely fabrics! Am following Fabric Fly's fb page, using my Sew Fresh Quilts page! love the fabric today….. and the contest…. Following Fabric Fly on facebook. Maureen...you're my hero. I love everything you do. I'm almost ready to try your QAYG Marvel quilt for my daughter. I love those fabrics!!!! Would love to win them! Great design, and beautiful colors! Thanks for the chance to win. These would make a GORGEOUS quilt!